If you have entered or are nearing retirement, then you're probably looking for stocks that can offer you a healthy dose of income. High-yielding Brookfield Infrastructure Partners (NYSE:BIP), Enviva Partners (NYSE:EVA), and W.P. Carey (NYSE:WPC) can all do just that. However, there's more to the stories here than just dividends. Here's a quick rundown on why these three dividend stocks could be perfect additions to your retirement portfolio. Keith Speights (Brookfield Infrastructure Partners): Retirees want a lot of some things and very little of others. You can put dividends into the former category and drama in the latter. Brookfield Infrastructure Partners offers retirees plenty in the dividend department with relatively little drama. Brookfield Infrastructure's distribution currently yields a whopping 5.56%. The partnership thinks it can increase its distribution by at least 5% annually. It has easily topped that goal in the recent past, with the distribution soaring nearly 47% over the past five years. But a high yield isn't so attractive to retired investors if it comes along with a tremendous amount of volatility and worries about the sustainability of the distribution program. That shouldn't be a problem for Brookfield Infrastructure. The company focuses on infrastructure assets such as communications towers, energy transmission lines, ports, railroads, and toll roads. These kinds of assets provide a reliable revenue stream that enables Brookfield Infrastructure to keep those distribution payments flowing. The company continually looks for opportunities to expand. And it sometimes sells assets to buy more promising ones. For example, Brookfield Infrastructure sold off its stake in a Chilean electricity transmission business in early 2018 and is redeploying its cash to buy stakes in a natural gas pipeline in India and a natural gas gathering and processing business in Western Canada. Such wheeling and dealing contributes to Brookfield Infrastructure's growth. Maybe there's a little drama with this stock, but it's the kind that retirees will like. Check out the latest Brookfield Infrastructure Partners earnings call transcript. Brian Stoffel (Enviva Partners): I'm still decades away from retirement age and tend to shy away from dividend-paying stocks. For Enviva -- which manufactures wood pellets in the American Southeast for use by European and Asian power plants -- I make a small exception. I first bought shares in August 2016. Since then, the stock is up 18% -- roughly on par with the S&P 500. When you throw in the effect of reinvested distributions, however, the returns are much better: 42%, to be exact. That's because Enviva currently offers a distribution of $2.53 per share per year -- equivalent to an 8.8% yield at today's prices. The thesis behind the partnership is simple: Invest heavily in logistics to manufacture and transport wood pellets abroad. This includes high-capacity facilities throughout the southeast United States, as well as deep-water ports in the Atlantic and Gulf of Mexico. Next, lock customers -- international power plants -- into long-term contracts. The average contract length as of the last quarter was 9.4 years. Then, focus on efficiency and squeeze out distributable cash flow for investors. I don't, however, think retirees should back up the truck on Enviva. Over time, its power company customers will probably transition to more sustainable inputs, like solar and wind. The contract lengths offer a buffer -- for now. The company also experienced a hiccup with a fire at a port in 2018 -- but has since recovered, and its distribution coverage is once again acceptable. In the end, a small part of your retirement portfolio devoted to Enviva has the chance for small share-price appreciation but supercharged returns thanks to the outsize distributions. Check out the latest Enviva Partners earnings call transcript. Reuben Gregg Brewer (W.P. Carey): Real estate investment trust (REIT) W.P. Carey offers retirees an over 6% yield backed by more than two decades of annual increases. That yield, meanwhile, is roughly 2 percentage points higher than those of its peers with similar dividend track records. Don't be too concerned about the yield difference; Carey's back story can be seen as a net positive for long-term investors willing to think outside the box. One big knock against W.P. Carey is that it historically operated an asset-management business. That operation has been largely shuttered at this point. It's now another boring triple-net-lease REIT, which means it owns properties for which the lessees pay most of the operating costs. It's a stable business model with long-term leases that usually contain built-in rent increases. Often the purchases Carey and its peers make are directly from the eventual lessees, who use the cash for things such as expansions and acquisitions. Carey makes the spread between its funding costs and the rates it earns on the property. 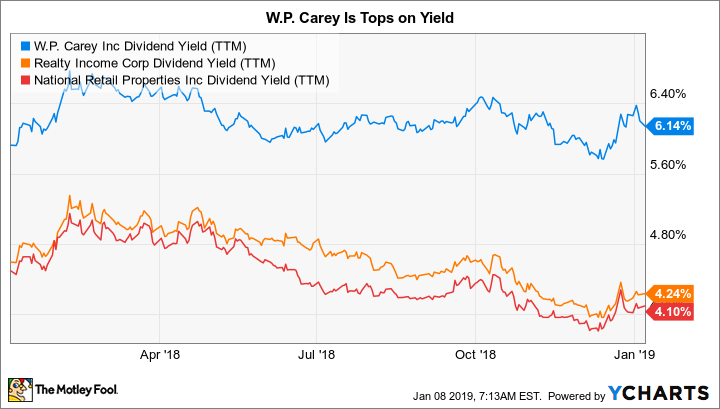 WPC Dividend Yield (TTM) data by YCharts. So far, so good. What separates W.P. Carey from most of its peers is diversification. The biggest names in this niche are focused on retail properties. Carey is spread across several sectors, including industrial (27% of rents), office (23%), retail (17%), warehouse (16%), education (4%), and "other." It also generates around 35% of its rents from foreign markets, while its peers tend to be domestically oriented. Far from a negative, all of this diversification gives Carey more levers to pull as it seeks out new investments. Yes, W.P. Carey does things a little differently. But its long history of success suggest that this is a net positive if you can see beyond the "typical" way triple net lease companies operate. Check out the latest W.P. Carey earnings call transcript.